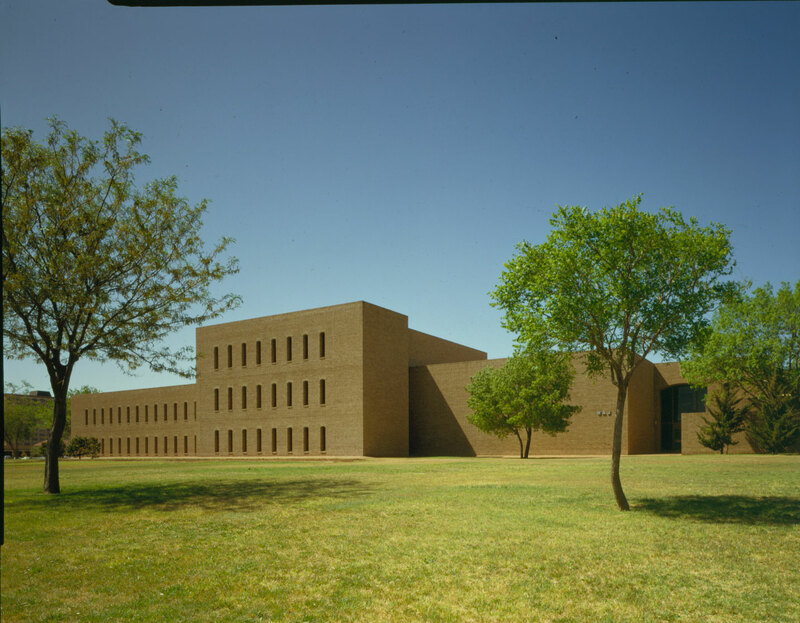 In its West Texas setting, the Texas Tech Law School Building interplay between a series of solid planes, varied columns of space, brick texture and native live oaks. 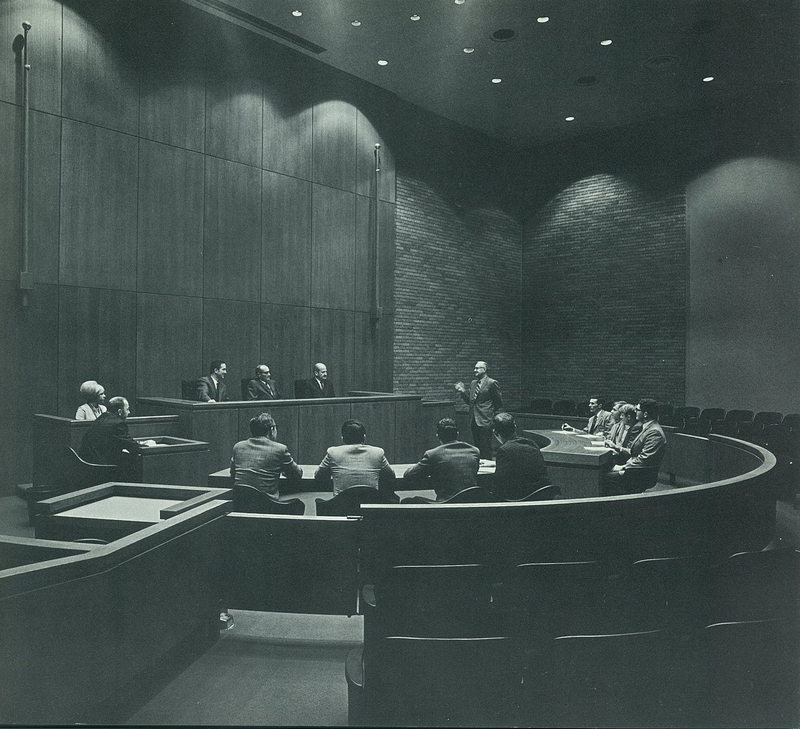 The School of Law was created for the once-projected enrollment of 585 students through 1975. At the time, provisions were being made for possible horizontal expansion of library, classrooms and faculty facilities. Early in the planning, it was agreed that this building should be compatible with other campus buildings which are an adaptation of the Spanish Renaissance style. This physical sympathy was achieved through utilizing the standard campus brick and the use of arched openings, deep set and scaled in relation to the variety of interior spaces. This is a low maintenance building, a structure which is reinforced concrete with exterior and interior brick walls, brick floor in public areas and carpet in classrooms and offices. The waffle pattern of the exposed concrete ceilings offers visual excitement and, together with the door and window arches and the brick floor, provides an architectural unity throughout the building. 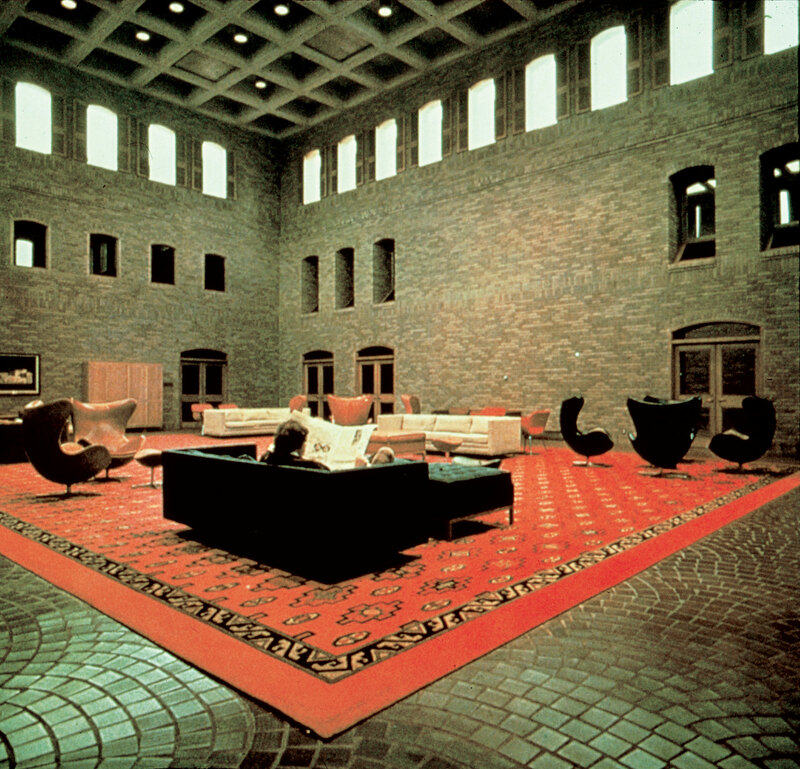 Noteworthy is the fine detailing of the fan design on the brick floor of the entrance hall. The texture of the concrete ceiling and brick walls and flooring is an appropriate setting for the mellow earth tone colors of the carpets and interior design materials. 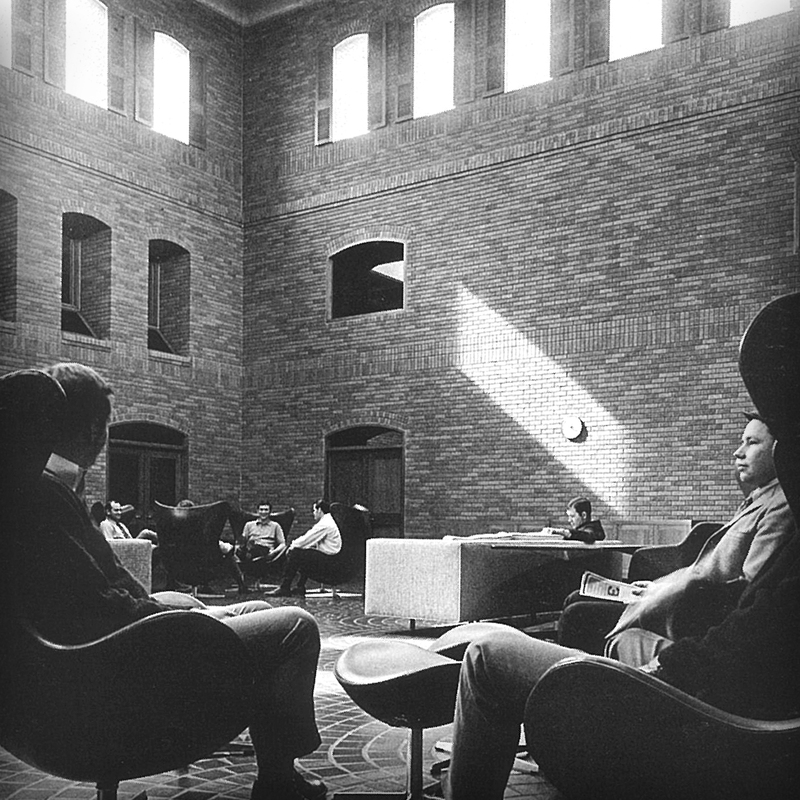 The administrator’s desire to maintain a personal relationship between faculty and students led to the dynamic concept of a multi-purpose room, contiguous to all other areas. This area, now called the Forum, became the nucleus of the building and all other areas are grouped around it in relation to their function and frequency of use. The school’s very heart is “the Forum” (so dubbed by the dean)—a three story commons around which the school’s life revolves. In the original program given to the architects, this important space was earmarked to go in the building’s basement. In this beautiful arena, students gain their courtroom training and develop their techniques. Seating 100 with space for three judges, the courtroom will be used for student practice in appellate arguments and for trials. Attorneys and other court personnel have room to move about freely. Overflow space for observers on both the first and second levels is provided by a glass wall at the rear and a sound system. Draperies are used to ensure privacy when desirable. The spaciousness of the room, the central focus upon the bench, the dramatic simplicity of wall and ceiling treatment evoke a feeling of respect for the law and enhance the “majesty and dignity” of the court. Thirty-three faculty offices, on the 2nd and 3rd floors, have direct access to the library and are convenient to class and seminar rooms. The third floor includes a faculty library, offering faculty members both the privacy for browsing and seclusion for their legal research. A conference room, with kitchenette, is available for faculty meetings and informal gatherings. The faculty offices are located for privacy and freedom from outside distractions, yet are conveniently placed to encourage and foster close personal student-faculty contact.